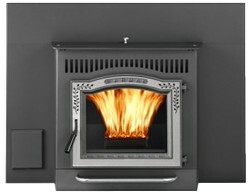 The Harman P35i pellet stove insert produces 35,000 btu. per hour on max, and can heat an area of up to 2,100 square feet. Two hopper sizes are available to accommodate smaller or large fireplace opening sizes. For ease of maintenance, Harman provide this pellet insert with a rail system that allows the stove to roll in and out of the fireplace - giving access to all the components without dismantling. For raised hearths, there is a stand which supports the front of the fireplace insert if it extends over the front of the hearth in maintenance mode. If you want to relax quietly without the blower on, the P35i can be run like that, although heat output will be reduced. This unit can be run either in stove temperature mode - keeping the stove at the desired temperature, or room mode - which senses room temperature. Hopper Capacity From 41 to 62 lbs. depending on the size of the fireplace it is installed in. Window Size 13.7 in. by 10 in. Rear Vent Height 18 in. Trim finishes in nickel, stainless steel or gold. The seal on the hopper gasket can deteriorate, resulting in inconsistent pellet ignition on start up, and the viewing glass becoming sooted up. Easy fix with high temp. silicone. Daily: Scrape the burn pot. Weekly: Empty ash, clean viewing glass. Monthly: Clean combustion fan and blower. Every ton of pellets burned: Empty the ash pan, scrape the burn pot, clean the heat exchanger surfaces. Once a year: Clean and scrape the burn pot and space underneath, clean the heat exchanger, clean ash from the inside of the stove, clean the combustion blower fan and convection fan, also internal flue. Clean fines from the fuel delivery system. Inspect and clean the external flue if necessary. Warranty transferable to a new owner for $25 fee within two years of commencing. If you would like to leave a review of the Harman P35i pellet insert, please use the form on the contact page.